Hi Florent In order to reset Max you have to delete the contents of "Max 6 Preferences Files" inside the Roaming folder. Thank you Tada for your answer. Not sure I am going to reset everything right now though. Could someone just please tell me what are the Max 6 default values for Poll Throttle, Queue Throttle and Redraw Queue Throttle please? I'd really appreciate. I would really like this answer as well if someone knows.. somehow resetting is not enough. 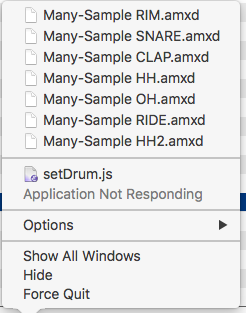 I just followed Ableton's advice and reinstalled Ableton entirely (Max 10 comes bundled). I also Reset Max4Live by deleting the Cycling74 folder entirely. Still, I'm noticing remnants from my past projects. Particularly, nothing can open and patchers crash Ableton every single time. When I right click Max, I see it's hung up with devices I already deleted long ago! Something is still being hosed up! WTF. Here's a picture showing the menu I get when I right click Max while frozen. Note all those devices are GONE from my computer because I deleted them even before I uninstalled everything. thx for pointing that out to me Source Audio, I didn't know that existed. Still not sure if I've found anything of value to fix whatever bug is going on, but that might be useful stuff in the future!